The new pages are not automatically linked to from anywhere so your customers will not discover them until you decide to manually link to them from your site's main navigation menus etc. Note: BrandChamp makes use of a Shopify integration feature known as an "Application Proxy" which means Shopify will make a call to BrandChamp servers when it needs to render those pages. I.e. there are no new pages added to your Shopify theme. The pages are served from our servers, but look like they are part of your own Shopify theme. You may not have any approved BrandChamps in the system at the moment, so the best one to test with is the application form at the /apply address above. If you can't see them yet, make sure you have set up your Shopify integration and take a look at the sections below for more details. If you still cannot see the pages, reach out to support@brandchamp.io for assistance. Note: each Shopify website can have a different theme so BrandChamp serves up very basic HTML pages which may require some fine-tuning with CSS to make sure they fit naturally into your site. See the "Styling Integration" section below for more details. We'll examine how you can edit these settings, and hence the web addresses, in the sections below. Those terms are used in the standard email templates and the "Ambassadors Plural Term" is used to make the web address for the new pages in your Shopify store. If you want to use a custom term, you can update the singular and plural form here. 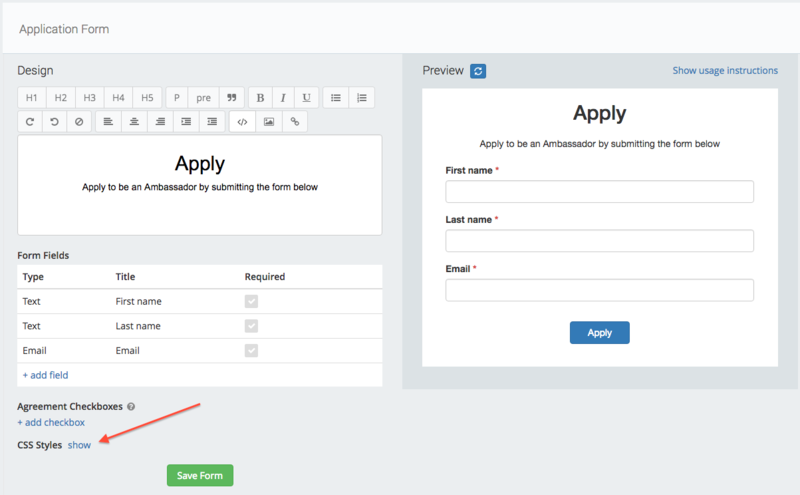 Note: You must use a single word phrase for the "Ambassadors Plural Term" in order for the website integration to work. E.g. "Super Squad" won't work - just use "Squad" instead. 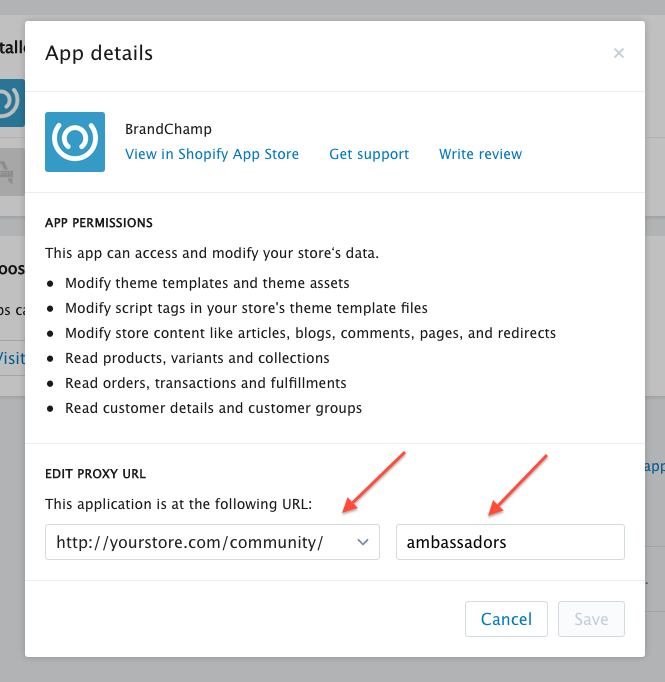 If you do change the plural term, you must also update the settings in the BrandChamp Shopify app as detailed below, otherwise the website integration won't work. When you authorized the BrandChamp Shopify App, it made that app available in your Shopify admin site. Note: BrandChamp makes use of a Shopify integration feature known as an "Application Proxy" which means Shopify will make a call to BrandChamp servers when it needs to render these pages and will insert the content at whatever location in the HTML markup is specified in your default Shopify layout file (or in the chosen layout file if you override - see "Custom Shopify Layouts" below). I.e. there are no new pages added to your theme. The pages are served from our servers, but look like they are part of your own Shopify theme. Note: the steps below assume a basic knowledge of web development so best to have someone technical on your team take a look at this. If you get stuck, reach out to support@brandchamp.io and we'll be happy to assist. It is recommended to use a tool like the Web Development tools in Google Chrome to inspect the HTML structure of the content embedded by BrandChamp and discover the CSS class names or IDs you'll need to override in the sections below. This section will show you how to customize the CSS for the application form page on your Shopify site - by default, at https://yourstore.com/community/ambassadors/apply. Click Save Form to update and test out your changes. To customize the CSS for these pages, you will need to add some custom styles to your Shopify theme. We recommend using a tool like Google Chrome's Web Developer Tools to examine the HTML markup and discover the class names that you will need to override. Chrome also has a useful feature where you can write the styles out in a text file, as if you were adding them to a CSS file. 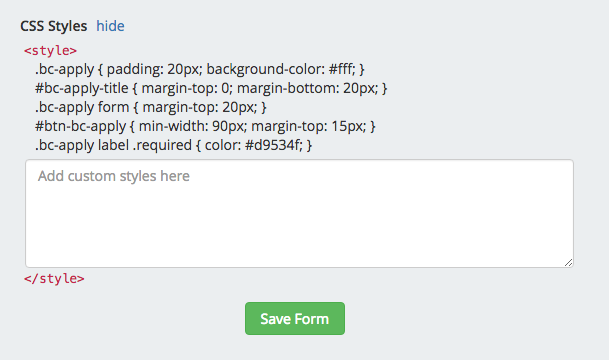 You can then copy and paste the styles into the CSS file in your Shopify theme to preserve the changes. This will open up a document where you are free to add custom styles as if you were adding them to a regular CSS stylesheet. Add in styles as appropriate until you get the desired results (recommend copying and pasting them out regularly to avoid losing your work!) 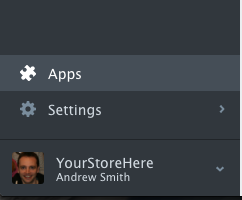 and then add the styles to your Shopify theme.